This course is about the important bits that come before the techy stuff. No, a website is not about jumping straight into the techy stuff. You need to know what you want it to do for you first. And you build that from the inside out. From strategy and empathy. The course is pitched at an introductory level. It's not hard to understand. But at the same time - a lot of websites don't pay attention to these ideas. Even sites that are counted successful, by people who ought to know what they're doing. They miss out on connection with visitors that they could have had. A message is a story in action. You have a message that wants to get out, that can help us make things better. I want to see that happen. Too often these messages get lost in the background noise and don't make the difference they could have. Your website is your home base on the internet. It's the only place online where you can control everything about your writing and the way it's presented. So give it the best chance of doing its job. 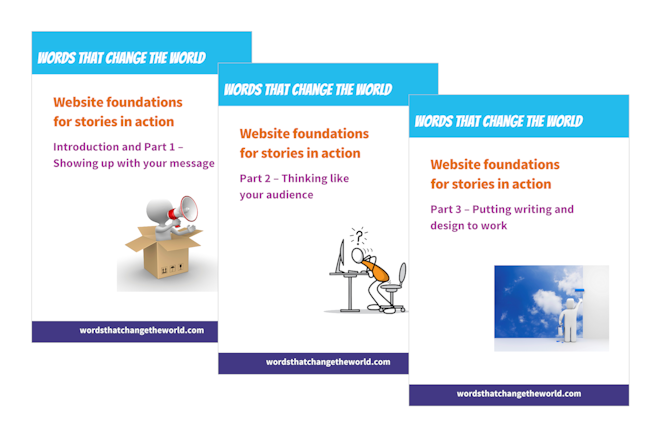 It's a set of three clearly laid out PDFs for you to work through in your own time. Each section has info and exercises. Part 1 - Showing up with your message. Part 2 - Thinking like your audience. Part 3 - Putting writing and design to work. There are also a couple of extras. Background message finder - a simple exercise that could give you the grounding for all your communication materials. Introduction to WordPress - although the course doesn't cover setting up a site, this tipsheet will point you in the right direction if you're new to the whole thing. Of course, most people get someone else to create their site for them. Even if you find a great web designer who has skills in design and user experience (and not all do), they won't be psychic. They'll still need you to tell them what you want. And it's your responsibility to manage the project and rein them in if they go off track. That's why these foundations are important even if you're not planning to go anywhere near the techy stuff. They'll put you in a stronger position for doing justice to your story so it can get out there and make your difference.